This easy crockpot candy is fun and festive. 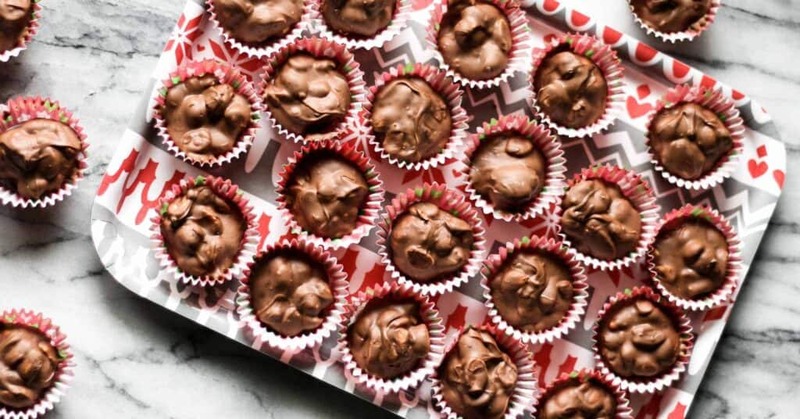 Chocolatey peanut clusters are a holiday favorite! 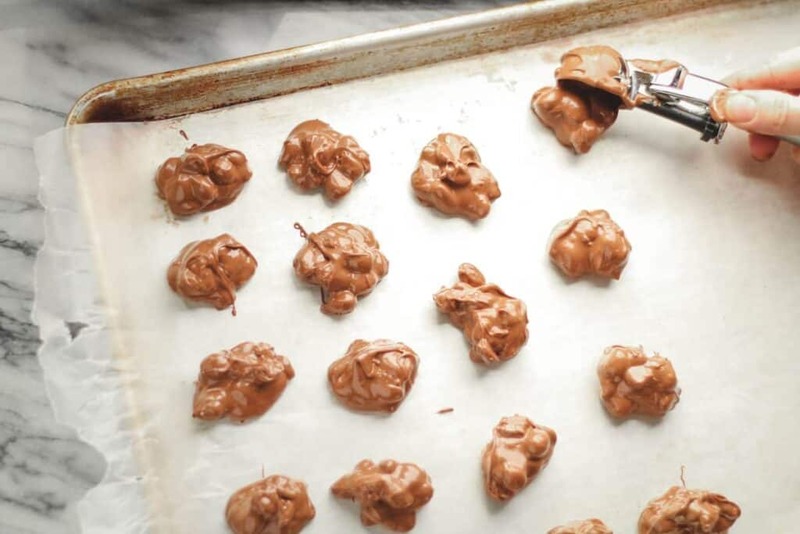 One of my husband’s favorite candies are Brach’s Chocolate Peanut Clusters. I decided last year to try and make them myself. 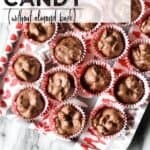 Of course there were a ton of crockpot candy recipes on good old google. I whipped up a batch and was proud of my endeavor. Much to my dismay… my husband preferred the Brach’s. He said my candy tasted too ‘fake’. I knew right away the culprit… Almond bark. Pretty much every crockpot candy recipe out there calls for mainly almond bark with a little ‘real’ chocolate mixed in. My chocolate connoisseur was not fooled. While the almond bark melts amazingly well… the taste is just not up to par. This year I took it upon myself to make a ‘better’ crockpot candy. One with high quality chocolate and little or no almond bark. Kudos to me, the results are in and this version was deemed the winner! 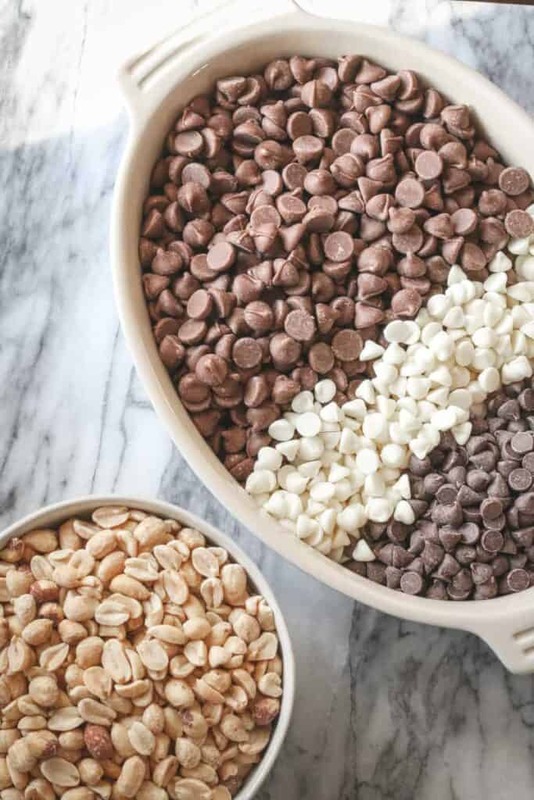 Chocolate Chips: Milk Chocolate, White Chocolate, and Semi-sweet. A couple of notes on the ingredients… go for high quality chocolate. I used Ghirardelli. If you want these to taste really good… you need really good chocolate. If you’re gluten-free, read the nut labels. You’ll be surprised what you find. Look for a label that says either: Peanuts. Or Peanuts, salt. That’s it. We don’t really need a whole bunch of other junk on our nuts, ya know? This could not be any easier. I think that’s the genius part of the whole thing! Put the chocolate in a slow-cooker. Turn it to warm and put the lid on. Let it warm for an hour or until chocolate is melted. Stir. Add in the peanuts and stir to coat. 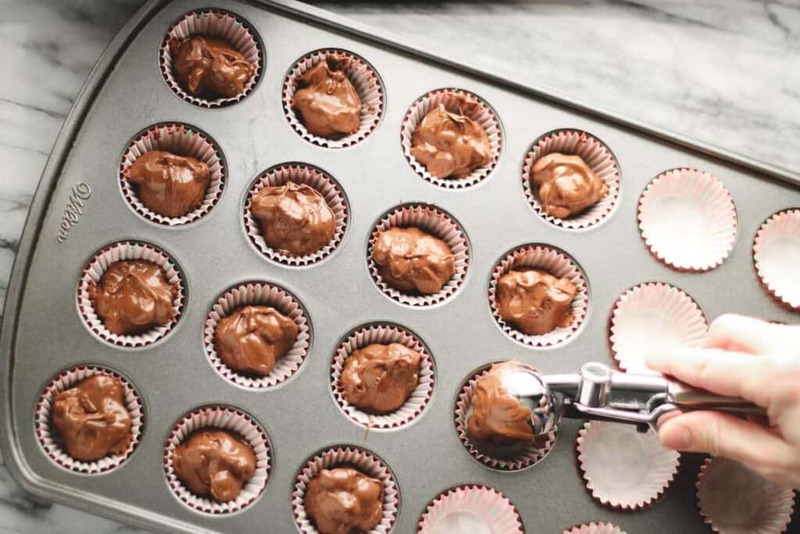 Once the nuts are evenly coated in chocolate, portion out the candy into mini-muffin liners. The liners add a fun and festive touch! 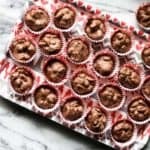 Pro-tip: If you want the candies to set and hold a nice & neat round shape (looking at you, Type A folks), line a mini-muffin pan with the mini-muffin liners, then fill with the candy. Leave in the pan until set. Voila! Alternatively, portion the candies out free-form style to be more like a peanut cluster you’d buy at the store. Just line a baking sheet with wax paper or parchment paper. Portion out about 1 Tablespoon of the candy on the pan and allow it to set. Use salted or unsalted dry roasted peanuts. Add sprinkles on top for an extra festive touch! 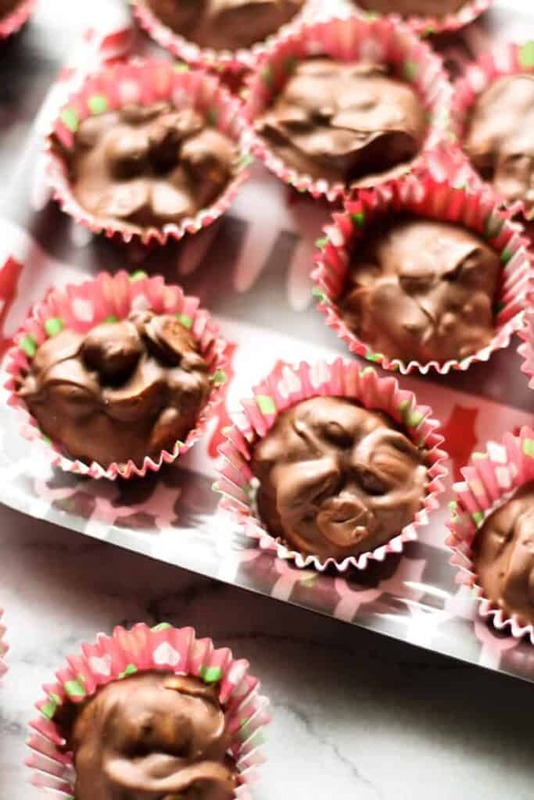 Store at room temperature or freeze the crockpot candy in an airtight container. Any combination of nuts would work in this recipe. 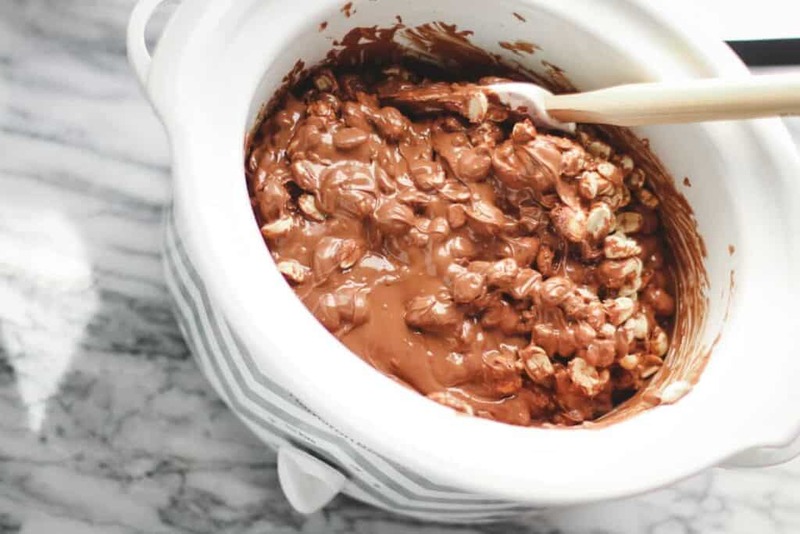 Crockpot candy peanut clusters made better with high quality chocolate. Place the milk, semi-sweet, and white chocolate chips in a crockpot. Put the lid on and turn to the crockpot to warm. 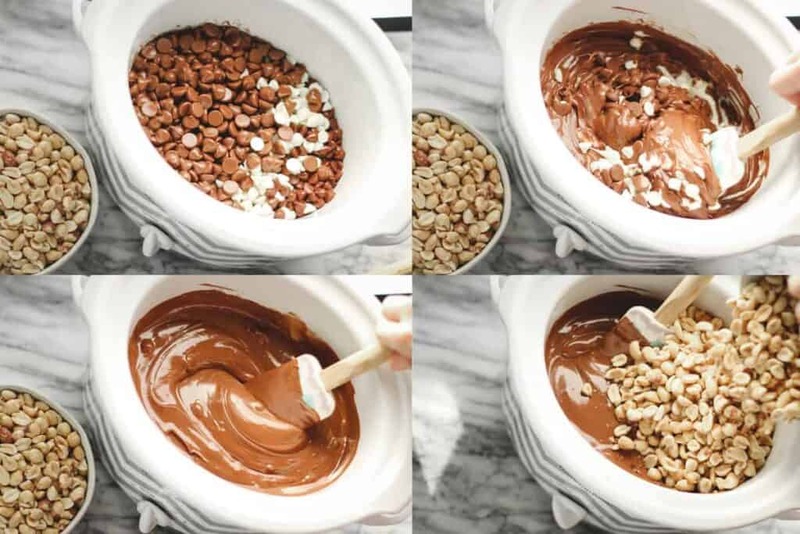 Let the chocolate warm for 1 hr or until chips are melted and stir. Add in the peanuts and stir. Drop by tablespoon into mini-muffin liners or onto parchment or wax paper lined baking sheets. Let the candy sit at room temperature until set. Store in airtight container. Keep at room temperature or freeze if needed. Need more Christmas treats? Make these Gluten-Free Sugar Cookies or Gluten-Free Peanut Butter Blossoms! These look sooo good! One of my favorite candies is Goobers, chocolate covered peanuts, but I never really considered making my own. I love that you use a combination of chocolates ???????? Thanks Carmella! 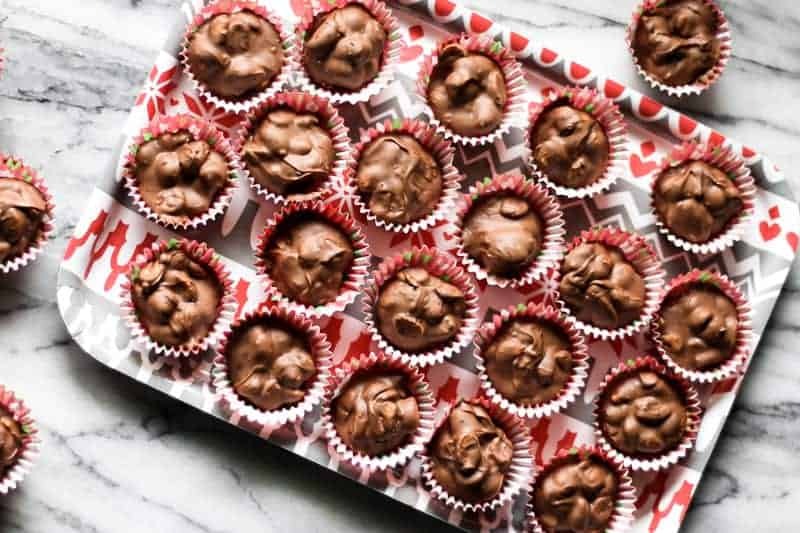 I have fun trying to recreate my favorite treats… Sometimes it’s easier than you’d think!